Definition at line 187 of file lscript_execute.h. Definition at line 190 of file lscript_execute.h. Definition at line 194 of file lscript_execute.h. References bytestream2integer(), i, mData, mType, and S32. Definition at line 209 of file lscript_execute.h. Definition at line 215 of file lscript_execute.h. References LLScriptLibData::getSavedSize(), i, LST_NULL, mData, mType, S32, and size. Definition at line 232 of file lscript_execute.h. References integer2bytestream(), LST_NULL, mData, mType, S32, and LLScriptLibData::write2bytestream(). Definition at line 255 of file lscript_execute.h. Referenced by getSavedSize(), LLScriptDataCollection(), LLScriptExecute::run(), write2bytestream(), and ~LLScriptDataCollection(). Definition at line 254 of file lscript_execute.h. 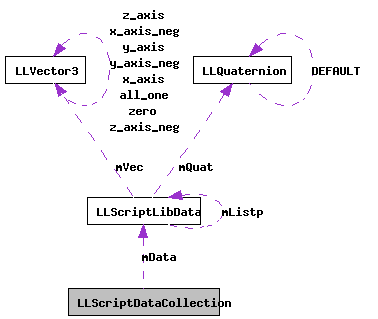 Referenced by LLScriptEventData::getNextEvent(), getSavedSize(), LLScriptDataCollection(), LLScriptEventData::removeEventType(), LLScriptExecute::run(), and write2bytestream().